NETWORK UPDATE: There was an extra 0.1 for THE GOOD WIFE, BROOKLYN NINE-NINE, ONCE UPON A TIME and 60 MINUTES in final numbers. SUNDAY NIGHT FOOTBALL adjusted to 6.7, 0.4 below the final for last week’s game. Even a zombie could guess that the top cable original on Sunday was THE WALKING DEAD (AMC), which convincingly beat even SUNDAY NIGHT FOOTBALL, and was up 0.59 from last week to 7.56. 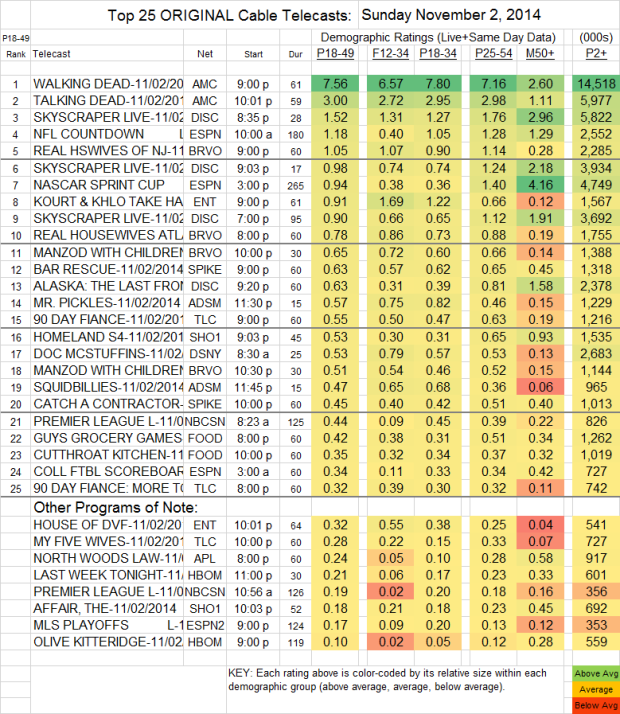 That boosted TALKING DEAD by 0.35 to 3.00, and even a rerun of COMIC BOOK MEN climbed 0.24 to 0.68. HBO’s OLIVE KITTERIDGE, despite what may have been the year’s best set of reviews, managed just 0.10 in 18-49s and 559K viewers, although for HBO the airing of an acclaimed work like this is at least as much about brand maintenance (and Emmys) as ratings. LAST WEEK TONIGHT impressively doubled the OLIVE rating to 0.21, although that was down 0.15 from last week. On Showtime, HOMELAND and THE AFFAIR were very steady, HOMELAND remaining at 0.53, and AFFAIR down 0.01 to 0.18. On the unscripted side, Nik Wallenda’s Chicago SKYSCRAPER LIVE (Discovery) was at 1.52 (followed by ALASKA: THE LAST FRONTIER, up 0.09 to 0.63). and ESPN’s NASCAR coverage was at 0.94. Bravo’s REAL HOUSEWIVES OF NEW JERSEY zoomed by 0.31 to 1.05 after a REAL HOUSEWIVES OF ATLANTA lead-in episode was at 0.78, and MANZOD WITH CHILDREN gained a tenth to 0.51. E!’s KOURTNEY AND KHLOE was at 0.91. On Adult Swim, MR PICKLES dropped 0.03 to 0.57, and SQUIDBILLIES was at 0.47.